Sometimes there can be fit issues with Zoe Kravitz her red carpet looks but she does make great choices. She joined her castmates on the blue carpet for the 'Fantastic Beasts: The Crimes of Grindelwald' premiere at Cineworld Leicester Square yesterday evening(November 13th) in London. 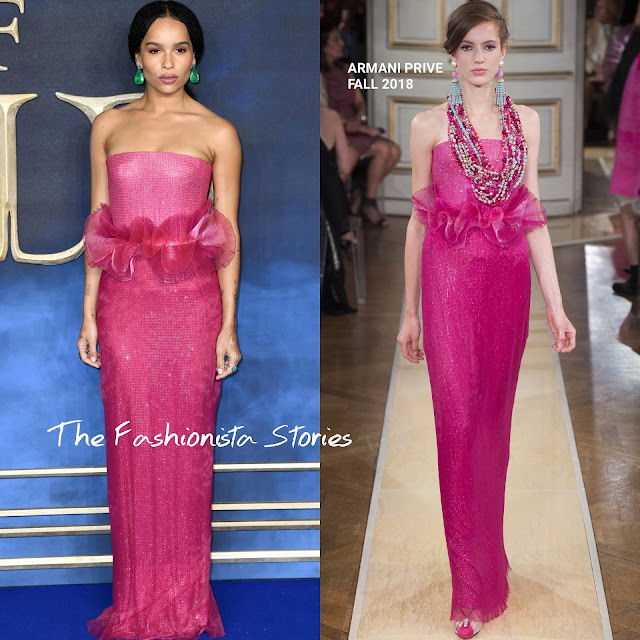 She definitely had my attention in this GIORGIO ARMANI PRIVE FALL 2018 fuchsia strapless, crystal-embroidered organza gown with a crinoline peplum detail. This gown looks so much flattering on Zoe than it did on the model. However I wish the hem was shorten about an inch and once again, I find the gown to be a little too tight on the bust. But that doesn't stop me from loving this gown on Zoe. Also those LORRAINE SCHWARTZ emerald earrings against this fuchsia hue, sealed the deal. What do you think of Zoe's look?